I’m 21 and have lived with my grandparents (86, 88) since I was six. We’ve loved and cared for each other all these years. Now both have dementia—they’re confused, sometimes incontinent and have recently begun calling me by my Dad’s name. How do I continue to care for them? You and your grandparents are lucky to have shared such a wonderful relationship. You can continue loving and caring for them by educating yourself to their needs and options: Call the experts at Alzheimer’s Community Care (772-223-6351 (Martin772-223-6351/St. Lucie- 772-460-9166; Ft. Pierce- 772 466-3261), the Alzheimer’s Assn. (800-272-3900), or Alzheimer’s/Parkinson’s Assn. (Vero 772-563-0505). 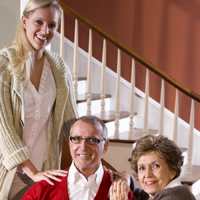 Ask for a home visit to help you get an accurate diagnosis and the care your grandparents need.